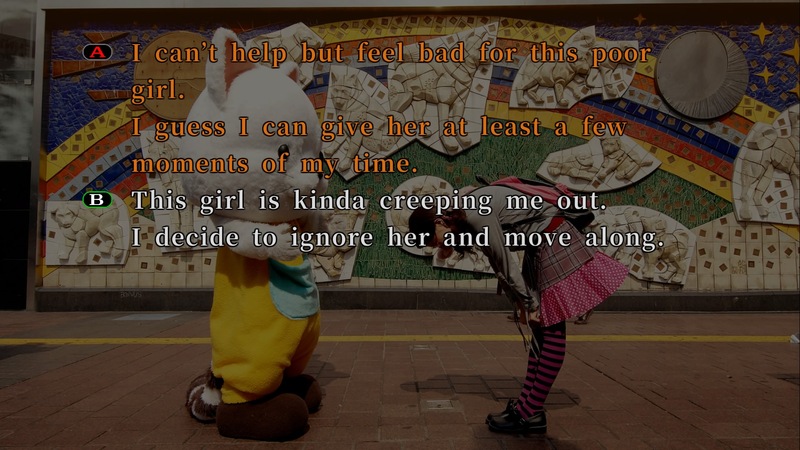 There are certain things one comes to expect from a new visual novel after having played enough. Things like structure and visuals, even if every game has its own distinct style, still tend to be fairly consistent between games. Elements such as the branching plot leading to multiple endings and anime-styled visuals with sprites over backgrounds are to be expected, to the point where games that take unique approaches to both are few and far between. 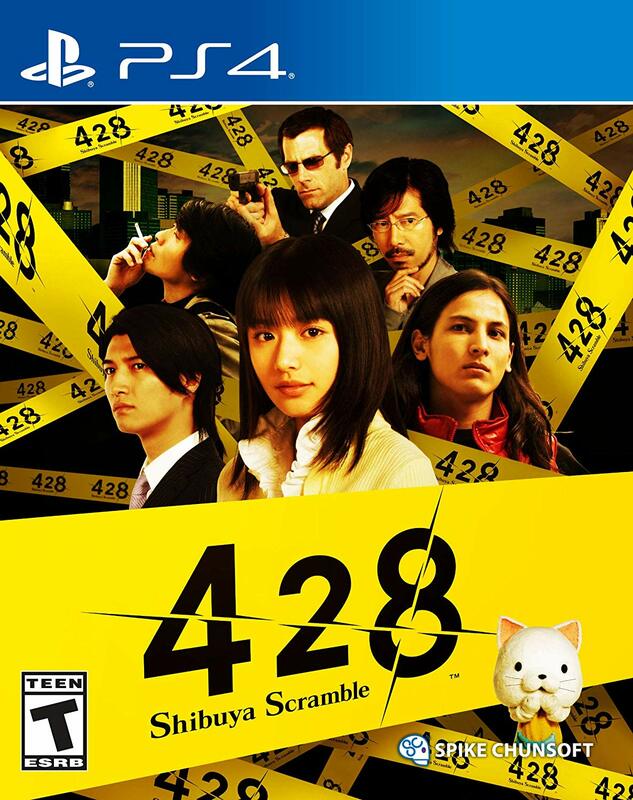 428: Shibuya Scramble, first released for the Wii in Japan in 2008 (with PS3 and PSP ports following in 2009), is one of those games, with a structure unlike anything I’ve seen before, and visuals few games have attempted since the early days of CD-ROM-based FMV games. Now, ten years later, Spike Chunsoft has brought the venerable game to modern platforms, and to the world with an English translation. Be careful with your choices, you never know who they might lead to a bad end. 428 stars five different protagonists: the young detective with the Tokyo Metropolitan Police Department Shinya Kano; the street punk with a heart of gold Achi Endo; the freelance tabloid reporter Minoru Minorikawa; the detached virologist Kenji Osawa; and the girl in a mascot costume with a mysterious past Tama. 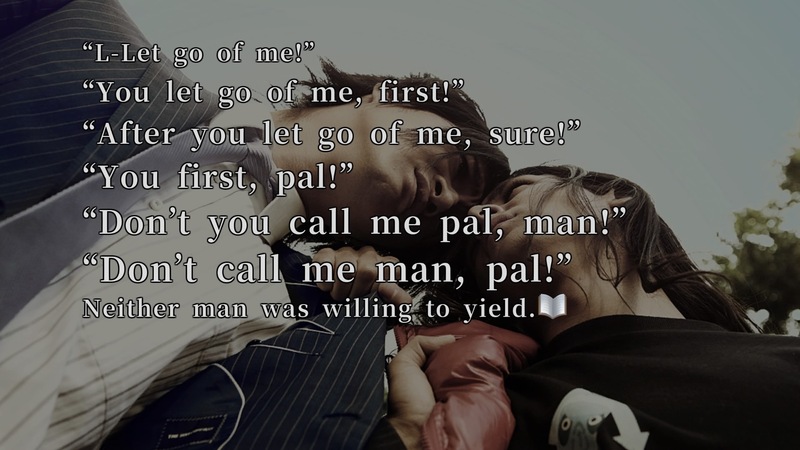 The connection between them strengthens as the story progresses, the player learns more about them, and the central mystery unfolds, while the individual characters’ story paths cross throughout. Each arc also has its own distinct tone – Kano’s story is a police thriller, Achi’s story is straight-ahead action, Osawa’s story is more psychological, and Tama and Minorikawa’s stories are more comedic. 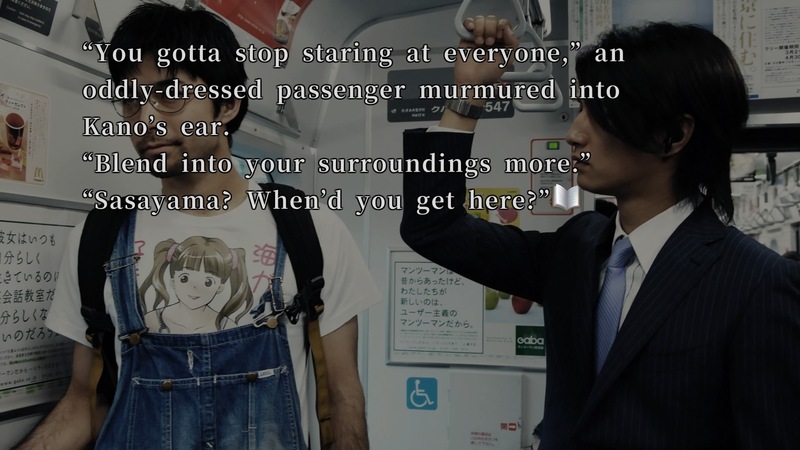 The most immediately-recognizable thing that sets 428 apart from other visual novels is its novel visuals, as it were. Everything in 428 (with the exception of some of the bonus content) is live-action, consisting of photographs and occasional video of actors. This is actually something that initially turned me off from the game – being used to games with more common anime-styled art – but the presentation is excellent, especially the actors’ portrayals of their characters lending everything a great sense of personality. Kano (on the right) and his partner Sasayama, in standard police garb. The game makes excellent use of its multiple concurrent stories. 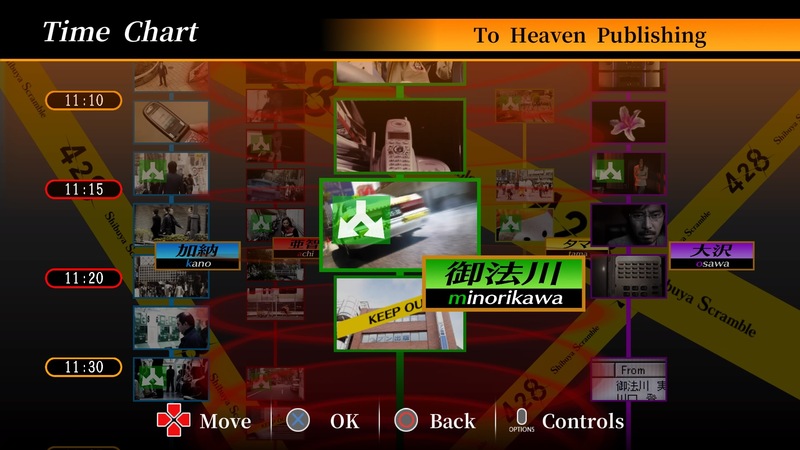 By using the Time Chart – an in-game flowchart of sorts – the player can jump between different characters at any time. Not only that, but choices made in one story can affect outcomes in others. For example, it’s not uncommon for one story to naturally lead to one of the game’s many (85 in total) bad ends, with the only way to avoid it coming from choices in other stories. The idea seems like a labyrinth at first, but it didn’t take me long to have a general sense for how to avoid bad ends I got, even without using the provided hints. The only time I found it frustrating was at the very end, where it really does become a minefield trying to find your way to the epilogue and true end. Aside from bad ends, there are also “KEEP OUT” points along the various paths, where you need to reach a certain point in another story and then jump from a text prompt back to that point to continue. The game is divided into time blocks consisting of in-game hours, and any choices made in a time block can only have effects within the same block. Finishing the time block with all characters (reaching a “TO BE CONTINUED” flag) allows you to advance to the next block. Figuring out the magic sequence of choices that allowed me to get through a time block successfully was incredibly satisfying, especially when I managed to figure it out without using hints, and made me almost feel like I was gradually unraveling the central mystery right alongside the protagonists. It’s somewhat more involved than many visual novels where you simply make choices to progress the story, and that’s something I quite like about it. This is the Time Chart, your main way of navigating around the various stories. The writing itself, aside from Tama’s story and Canaan’s side story, is all in third person, as opposed to the more common first-person style in visual novels. That along with how dialogue and situations are presented gives it a flow similar to a physical novel. All in all, it feels like an adaptation of a detective thriller TV series or movie, especially with how the time blocks section the story and give it almost an episodic feel. I like the segmented presentation; the pacing is excellent, and along with the general sense of progression it gives, it also helps keep the effects of choices from getting out of hand, since when you hit a bad end you only need to seek a solution within the current time block. Even so, the density of events within each block still lends some challenge to it, especially when avoiding a bad end relies on more than one choice. Standard interactions between civilians and police.